Rating: 7.0/10. From 210 votes. The changeable backstraps and changing tool. 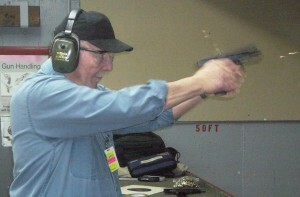 For the rest of us Glock devotees, we’ve long recognized that there are three generations of Glock pistols. Not including some model variants, First Generation guns have a finely-pebbled grip area. Second Generation guns feature grenade checkering on frontstrap and backstrap. Third Generation guns added finger placement ridges on the frontstrap and dished-out thumb rests on the top of the side panels, along with an accessory rail located on the dust cover.Gen4 is short for Fourth Generation of the Glock pistol, the formal existence of which began in 1980 as a result of Gaston Glock’s pistol winning the Austrian Army’s field trials held to find a new handgun for its military forces. After this success, Gaston Glock early on adopted the term “Glock Perfection,” intending this to be a never-ending goal of making and selling the very best handguns possible. To support this, any modifications to the Glock gun were simply integrated into ongoing manufacture. (For anyone who attempts to follow or know all of these modifications—good luck!) Officially, until the Gen4, there was no formal recognition of generational changes to the design. As far as internal changes, I doubt any one person has a complete listing. I even doubt that Glock Gmbh itself has a formal list. Of course, adding to the challenge of compiling such a list, not all the forgoing changes were made to all models. The Gen4 features several significant changes. The grip is the Short Frame (SF) version, making it shorter front to rear than a Gen3 frame. 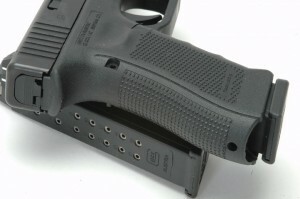 Glock supplies two additional backstap attachments, either of which can be added to the grip to change it to a standard or large frame. It’s easy to identify the Gen4 model: The new spring system has a larger front spring cap. The Rough Textured Frame (RTF) surface treatment has been modified, making the spike-like projections dubbed “polymid” in earlier versions smaller and not as sharp (and now termed “cubid”). Also, the finger grooves are not as prominent as those found on a Gen3 gun. The rectangular magazine catch remains grooved but has been enlarged and then lengthened rearward. The catch is also reversible now, and you can change it easily by simply reversing the release and reinstalling the magazine-catch retaining spring. The dimension of the dust cover accessory rail and the extractor, which continues doing double duty functioning as a loaded-chamber indicator, remain unchanged. In addition, the Gen4 pistol now uses a version of the dual captive recoil spring found in Glock’s subcompact models. I noted two other changes. 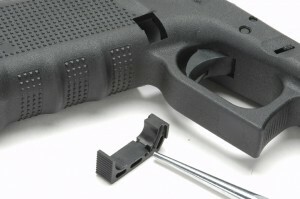 There’s a vertical cut in the left rear of the frame just forward of the left-rear guide rail, and the forward lower arm of the trigger bar is now notched below the trigger spring attachment opening. I suspect the vertical cut is to allow installing a radio-frequency identification (RFID) tag, say for inventory or round count. The notch controls trigger spring movement at its attachment point, and less flexing should decrease breakage at this point. 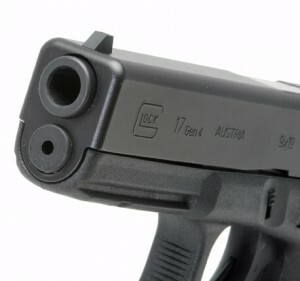 The rest of the Gen4 gun remains standard Glock with fixed sights. The square-notch, white-outlined rear sight is dovetailed into the slide for windage adjustments, with additional sight heights available for elevation changes. The front sight is pinned in and has a white dot in its face. Night sights are a (U.S.) factory option. The cubid treatment covers the entire gripping surface on the frame. The extractor also serves as a loaded-chamber indicator and the smooth-faced Safe Action Trigger pull measured 6 lbs. (Various trigger-weight options exist, again in the U.S.) The magazine is constructed to allow for ambidextrous or reversible release. All other dimensions and metal treatment have not changed. The Gen4 ships (U.S.) with three magazines, magazine loader, cleaning rod and brush, all in a lockable polymer storage case. When looking at the interchangeable grips, I thought this modification was well overdue because companies such as Smith & Wesson, Ruger, SIG Sauer and Heckler & Koch all offer grip-altering options. In addition, this requirement is finding its way into official military and law enforcement agencies’ requests for bidding (RFB) to supply new handguns. For example, sometime prior to 2010 a U.S. federal agency included this specification in its RFB. Forward-thinking Glock has a G22 Gen4 in .40 SW ready to go. When I examined the additional backstraps of my sample Gen4 gun, I looked to see how well (or not) the attachment was designed, because I could foresee it shifting or coming off at the worst possible time. Well, Glock did its homework. The lower edge of the backstap has a sturdy lip hooking over the opening in the lower frame, and it’s secured at the top rear of the frame by a longer replacement trigger housing pin (supplied), using the also-supplied disassembly tool. Both backstraps fit snugly to the frame. The two backstraps are marked, respectively, “M” (2mm) and “L” (4mm). By adding the M backstrap, you move up to a standard frame, while the L backstrap creates the size of a large frame. With either, you can still use the lanyard-attaching hole in the frame because the backstraps have a matching opening. To install, you simply remove the trigger housing pin with the supplied disassembly tool, then select one of the two units supplied and insert the corresponding longer trigger housing pin. The written and pictorial instructions included with the backstraps help. The mirror slots (indicated) are a simple answer to providing a reversible magazine release. The frame’s finger ridges have been slightly decreased in height. The nice “problem” here is I find I very much like the SF grip. Also, I have historically shot standard- and large-frame guns equally well. I did shoot with both optional backstraps, and they stayed put. Realistically, they need long-term use and abuse for a proper answer. I suspect any field testing will be performed by end users—those who have expressed the concerns this alteration is supposed to address. This grip option will also help address complaints from some (primarily employed in government entities) who, having failed to pass a required course of fire, claimed their reason for failure was due to the gun not fitting their hand-size properly. I also wondered about the why and how of the recoil spring system. I strongly suspect this change resulted from Glock’s ongoing effort to build a G22 in .40 SW that won’t malfunction regardless of the ammunition used, with or without the addition of the now almost ubiquitous lights and lasers hung on the gun’s dust cover. As I see it, the problem is the frame flexes when the gun is fired, and this distortion is a large factor in how the gun operates. Changing ammunition and hanging a weight on the frame certainly can change this dynamic and can result in the worst possible malfunction—episodic and not repeatable on demand. In short, Glock was forced into playing whack-a-mole. 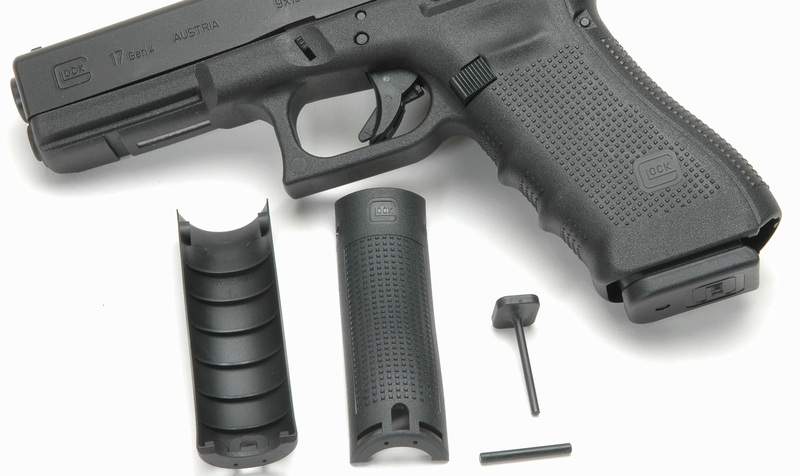 Changing the recoil spring system affects the interaction of slide and frame, so reverting to a version of the dual captive recoil spring used in the subcompact Glocks might just be the definitive cure. 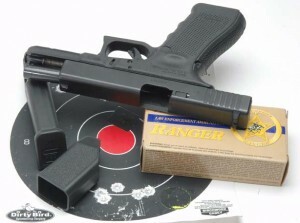 The author fires three quick rounds with the G17 Gen4. In my non-scientific opinion, I think Glock has really done its homework, although any final determination of success or failure can only come from multiple end users. One final thought: The new unit should double or triple the number of rounds you can fire before spring replacement is even recommended. I did find one-and-a-half downsides to this change. The most obvious? You need more strength to manipulate the slide than before. (I wouldn’t bet against this being the next excuse for the aforementioned qualification failures.) Late-breaking news: A reliable source told me there’s a strong possibility the G17’s spring weight will be decreased based on reports of the slide failing to fully cycle with one or two brands of ammunition. No further details were available at press time. The “half” problem? The gun is now slightly more difficult to reassemble, with more care needed to ensure the recoil spring unit is exactly centered against the barrel abutment when re-installing the slide. In repeated range visits, I found my ability to shoot well (or not) was not affected at all by the shorter SF frame. To put a sharp point on this, I had completely put the backstrap options out of mind until I came to write this review. On my next range trip, I did shoot with both, and they did nothing good or bad to my gun manipulation and shooting results. Shooting seated and supported I managed five-shot groups from 1.5″–4″ at 25 yards with the gun shooting to point-of-aim. The two backstraps are now back in the Glock case, where I suspect they will never again see the light of day. Target results. The Gen4 is accurate! If you need to verify parts compatibility, a new, updated Glock Armorer’s Manual is the best way to go. The Gen4 Glock is a winner for me. So much so that I bought it—and I’m strongly moving toward selling my first and second gen G17s! 9mm 17+1 7.87″” 4.49″ 5.43″ 1.18″ 22.75 oz. This entry was posted in $251-$500, $501-$750, 9mm, Full size, Glock, Semiauto and tagged Handgun Reviews on December 7, 2010 by Walt Rauch. I agree with Mr. Rauch, the Gen4 is a winner. Also like Mr. Rauch I prefer the SF over the back strap attachments. As for reliability issues, I fired 200 rounds (Winchester 9mm white box) today with no problems. Maybe not for everyone but for me the Gen 4 works. i bought my g17 gen 4 sometime december 2010, and barely 3 mos has lapsed…i noticed a hairline crack on the breech space just behind the extractor. I use self reloads, 135 grains teflon coated heads,3.4 load OBP gunpowder…with a power factor of 131 for IPSC Production Division shooting. I own a Glock 17 Gen 3 that I love but my wife hates because she can’t fit her hand around it. So last year I purchased a Gen 4 and she loves it. We haven’ t had any problems with it. It was a great investment. I’ve owned a G17 for about 7 years now. I use it as an everyday carry pistol. I have nothing bad to say about Glock or the G17. I do have one gripe though. The slide release is a bit too small and takes some time to get used to. Under high stress drills with gloves on or sweaty hands it’s nice to have an oversized and extended slide release like the one on H&K’s USP .45. I was surprised to see that Glock had not done anything about the small release. Just a thought. i have been a glock owner since the early 90’s, with that said i am also former military and shoot on a buddy’s private shoot house to practice for three gun comps. having shot hundreds of thousands of rounds thru many platforms i have to say a few things every glock owner should know. First glock 17’s is not the best gun for every thing and they are not perfection like so many people have said like ANY and ALL guns under the right conditions they can and WILL jam. 2nd glocks are a simple and roubust gun but like any other gun they still need to be maintained i have had more then 100 jams in the last 6 glocks i have owned ( glock 17’s all of um 3 of witch were gen 4’s) and i put no more then 1500-2000 rounds each threw them. i am not saying they are a bad gun i am however saying the never jams and all that $hit dose not fly with me. i have how ever had jams with every platform i have EVER shot so this isn’t a huge deal. What is a huge deal is Glocks customer service, i have to say one of the worst things i have ever had to do is ship a Glock back to glock. what happened was the frame was not cured properly (gen 4) and had a crack that was about 2 inches long in fround of the left rear rail. Well i called up glock they told me it was “imposible” to happen when shooting factory loads,sent in the gun that shut them up, so 6 weeks go by i get a call and they said “i am sorry Mr ******** but you did notinclude payment for the service or the shipping back for the gun you sent to us” so after almost 400 dollars ($379.89) i got my glock back, but not before they sent me another bill asking for me to pay the $29.99 for overnight delivery. i bought this gun brand new i love glocks i know their limets and understand they are not the only gun out their and i recomended them A LOT before this happened now i have to say i recomend SIG’s more offten now because the service is better and they are more accurate ( most of the time). But if you can get over the problems with Customer service then i think you should get one they are a great gun for the money. i will only be building my own glocks off on Steel Frames from now on !!!! just so i can weld um up if their is a problem hope this review helps you and for all of you out their who say its imposible then better take a big swig of reality because its a B^tch! I bought a Glock 17 gen4 just a couple of months after they hit the gun store. I did alot of research on guns and handled alot of guns before i made up my mind. Eventually i has either going to go with the XDm or the Glock 17 gen4. I like the fell of the glock better than the XDm and it felt quicker in the hand. The Glock lost one star due to the fact that i hate the sight picture and that it is harder to manipulate the slide with one hand when hand is sweaty. Yes, i did replace the recoil spring(RSA) in the gun and, it is still 100% with quality brass cased ammo. The problem with the orginal RSA was that the spring lacked a capture piece to keep it from sliding off the rod. It took about 500rds before i noticed it starting to slip. The new RSA is the same just with the metal washer to keep it all together. The problem is fixed and all new guns do ship with the new RSA. I owned one for about a week,total piece of junk,I sold it to some fool for $50 more than I paid for it,he doesn’t like it and wanted his money back but I don’t give refunds.I won’t even give it one star because it was such a piece of crap. I’m a proud owner of one of these Glock 17 for almost a year now and in my opinion it’s one of the best 9mm guns out there. I also own a Browning Hi-Power, which is slightly better in performance, but the Glock is still my favorite gun to carry. I love the Glock 17 – I can feed it absolutely anything in terms of ammo and I’ve never had any problems— even reloaded ammo. While I think feeding issues are sometimes overblown by shooters – I’ve put about 4,500 rounds through this firearm and never had so much as a jammed case. (Mind you, I’m really good about cleaning after every trip to the range).